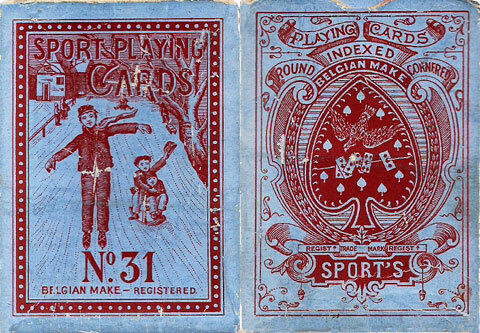 Etablissement Antoine van Genechten S.A.
Van Genechten first registered an Ace of Spades for English playing cards in 1885 followed by several brand names, and also the ‘Sailor’ Joker, as shown here in a pack of “Sport No.31” playing cards published in around 1910. The box has artwork derived from the Ace and also ‘Regd Trade Mark’. Apart from playing cards, Van Genechten was at this time producing coloured paper, cardboard and pasteboard, as well as manufacturing and printing (letterpress, lithography and offset) all manner of packaging materials. 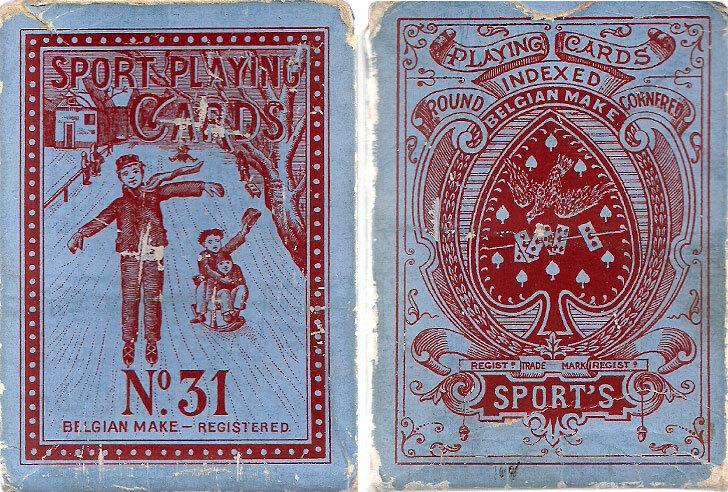 Above: 'Sport No.31' playing cards manufactured by A. van Genechten, Turnhout, Belgium, c.1910. The Ace of Spades was a registered trade mark since February 1885, and this was followed in 1888 by the Sailor Joker designed by Houssiaux of Brussels. The court cards appear to be inspired by the designs of De la Rue. Images courtesy Rod Starling.